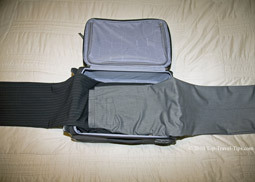 Few practical travel tips for packing luggage can make the travelers life easier. Knowing what to pack and even more importantly, how to pack it can make all the difference. There is no one right way to pack your bags. Whatever packing method you use, it is all about making the most of the limited space available, to fill all space as efficiently as possible. Whether you are packing a suitcase, carryon bag, backpack, or any other type of bag, there are three main packing methods: the folding method, rolling method, and bundle wrapping method. We explain each method in details and with photos as well. Maybe the most common way of packing is by folding the clothes, i.e. similar to when putting clothes away in a wardrobe. 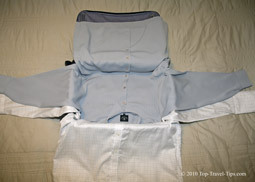 Folding the clothes will though make the clothes crease when compressed in the bag. However, if you prefer to fold your clothes when you pack your bags, then there are few travel tips for packing luggage that you should bear in mind. You can notably reduce creases by folding one item over another. 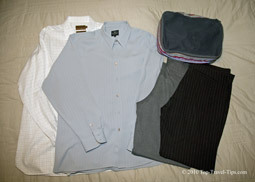 Start by taking two or more items of clothes, like trousers, and lay half of one pair on top of the other. Fold the one on the bottom over the one on the top. Then take the other and fold it over the first one. This gives each pair some support where you have folded it, so it will crease less in the folds. 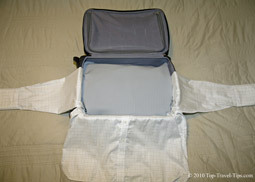 The following travel tips for packing luggage photos show this type of folding packing method in practice. 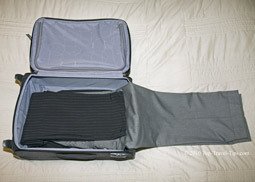 Socks and underwear can be excellent “fillers” when you pack your bags. For example, your shoes have empty space inside them, which is ideal to fill with your socks. They can also fit nicely into any openings in your final packed bag (instead of keeping them all together in a separate bulky bag). 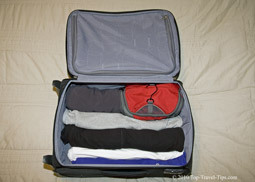 Rolling the clothes not only makes them less likely to crease; they also take much less space this way. 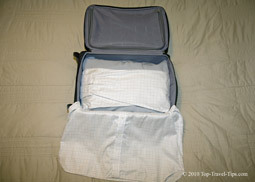 Rolling therefore tends to be the favored packing method among backpackers. The rolling method works well with most clothes. 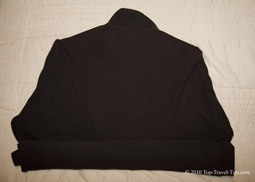 Just lay each garment face down, fold back the sleeves if applicable, and then roll the garment from the bottom up. Some put rubber band around each item to make sure they stay rolled up. 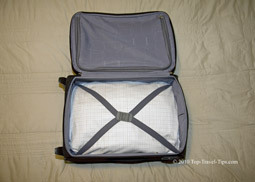 The following travel tips for packing luggage photos show the rolling packing method in practice. If you roll your clothes in tissue paper, the clothes will become less wrinkled. Tissue paper can also be great for delicate items, like evening dresses. Lay the dress face down and place some tissue paper on top of it. Fold the dress up with the tissue paper inside. Use additional layers of paper as you fold the dress so it's completely wrapped in the tissue paper. The bundle wrapping packing method is however the best way to pack your bags. As the name indicates, bundle wrapping involves wrapping your clothes around a central core object, hence avoiding the folds that cause creases. It may sound too good to be true but the bundle wrapping packing method works. 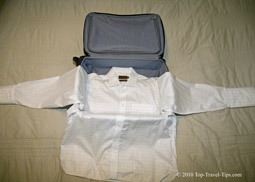 Your clothes will crease less than with the other packing method. 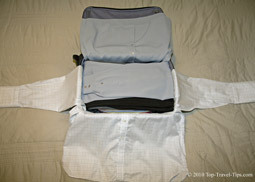 You can even pack wrinkled clothes and they will turn out less wrinkled when you unpack your bag. The bundle wrapping method also allows you to pack more clothes, which is always a bonus just make sure you stay within your luggage allowance limits. This packing method is a bit more complicated than the previous packing methods and it can take a little practice to get it perfect. It is though not as complicated as it may look at first glance. We recommend trying the bundle wrapping packing method, we are sure that you will be pleasantly surprised at the outcome. 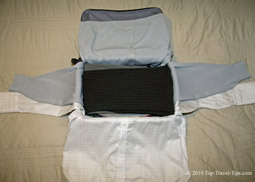 This packing method is described step by step below with photos as well. The result will be bundle of all of your clothes that looks like a pillow. You should be able to pick it up in one piece. Because it is compactly packed, you will be able to fit more items in your bag and because it is folded, your clothes will wrinkle less. Which Packing Method Do You Prefer? When you arrive at your travel destination, you just work in reverse order to unpack your bundle. If you only want to take out specific item in the bundle, just lay it flat and unwrap until you reach the item you want. Take it out and refold the remaining clothes. The bundle wrapping packing method might seem daunting at first but we recommend trying it. We are confident that you will be as pleasantly surprised as we were when we first tried it. The bundle wrapping method is not as complicated as it might seem, but as always... practice makes perfect. 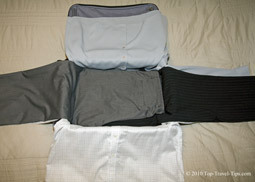 The following travel tips for packing luggage photos show the bundle wrapping packing method step-by-step. 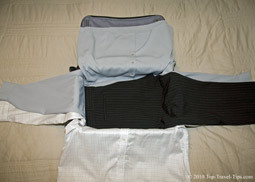 In this example, we show small bundle consisting of two shirts, two trousers and the all important core object. Your bundle can be as big as it needs to be. Whatever packing method you use, it is all about making the most of the limited space available, to fill all space as efficiently as possible. 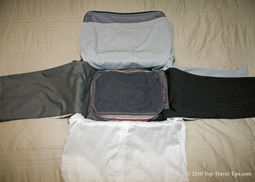 You might prefer different packing method for different types of travelling, e.g. 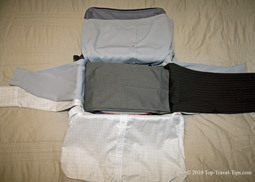 you might prefer the rolling method for backpacking trips but the bundle wrapping method for business trips. What you pack may also affect how you pack your bags, What To Pack is almost important as how you pack your bags. Ps. this video offers further practical travel tips for packing luggage.